A security firm has figured out how to turn an Android smartphone into a surveillance device that would make Q, the fictional gadget master in the James Bond movies, proud. The Security Labs of Kindsight, a part of Alcatel-Lucent, has built a proof-of-concept program capable of tracking the user's location, intercepting messages, recording conversations, and taking pictures. "Effectively, it turns the Android device into a spy phone," Kevin McNamee, lab director for Kindsight, said Friday. McNamee plans to present the espionage tool at the Black Hat USA conference next month. The technology, codenamed DroidWhisper, can be hidden as a component within any Android app and run covertly in the background, booting up automatically when the device is turned on. Once installed, the spyware would receive instructions from a command-and-control (C&C) server, which could communicate either over the Internet or through the phone's Short Message Service used for text messaging. From a control panel on the server, criminals or government spies would be able to control the phone's camera, video and still, and make use of its microphone and recording capabilities. The panel also would be used to collect all the recorded content and images, as well as any personal information on the phone. "The smartphone is an excellent platform, if you want to launch an insider attack against a corporate network or government network," McNamee said. "The device has all the capabilities that it needs. It has Internet access over the air, it can take pictures [and] it can record sound—a very powerful surveillance platform." While not part of the proof-of-concept, the spyware platform could be used to download tools for scanning a corporate network for vulnerabilities when an employee logs into a Wi-Fi network, McNamee said. "[The phone] has a completely fully functional network stack, so if it has access to the corporate Wi-Fi, yes, it can scan the network," he said. The most likely ways the spyware could be installed secretly is through an email-carried link to a malicious website, or an app provided through an online store. For example, the component could be injected in a bogus version of a popular game. While Google Play, the official Android store, scans for malware, most third-party stores do not. Roughly three in five of such stores originate in China and Russia, notes the latest mobile threat report from Juniper Networks. 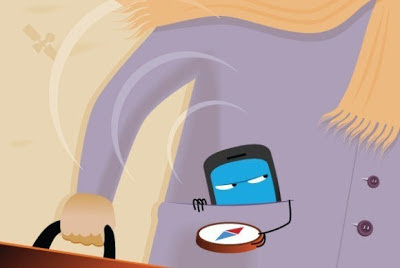 As of March 2013, more than 90 percent of the mobile malware detected by Juniper targeted the Android platform, nearly double the percentage in 2011. To install and run Kindsight's component on a device, the criminal would have to find a way to bypass Android's built-in security features. By default, applications do not have the permission needed to perform operations impacting other apps or the device in general. Such permissions would have to be granted by the user. Assuming that the spyware penetrated those defenses, then the next mode of detection for businesses would be in catching the network traffic between the component and the command-and-control servers.